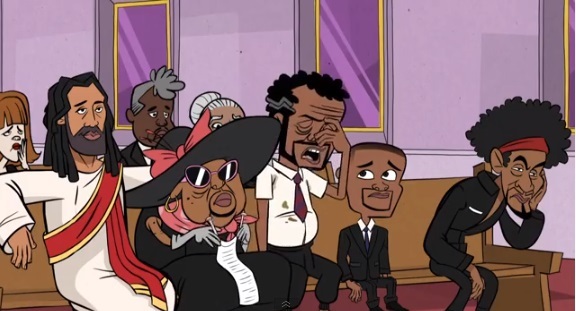 Somehow, between world tours and blockbuster movie deals, Kevin Hart has managed to create his own made-for-YouTube animation series, “Say It With Your Chest.”Bringing to life the story of his mother’s funeral in which the Let Me Explain comedian chronicled in his 2011 Laugh At My Pain stand-up show, you get to meet some of Hart’s best known family members including Kevin’s father Daddy Hart, Uncle Al, Grandma Hart and Cousin Richard. Hindered by a hormone imbalance that makes him short, but capable of growing a goatee, Young Kevin navigates the treacherous waters of friends, family and childhood as a precocious 8 year old. Married to his La-Z-Boy chair, Daddy Hart is committed to his street proven former drug addict sensibilities. He loves his son, but views the world as the Serengeti and Young Kevin as a lame gazelle. A former convict, Uncle Al views the world through a prism of a prisoner. He counsels Young Kevin as though both lived behind bars and his neurotic paranoid filled advice often creates more confusion than solution. Always accompanied by Jesus who is her silent copilot, Grandma Hart wields her advice through scripture and a switchblade. A tenth degree black belt, Grandma Hart is to be feared and respected, even by Jesus.